(Bloomberg) -- Fallen Nissan Motor Co. leader Carlos Ghosn may be on the verge of telling his side of the story of how he was unceremoniously ousted from the Japanese automaker. 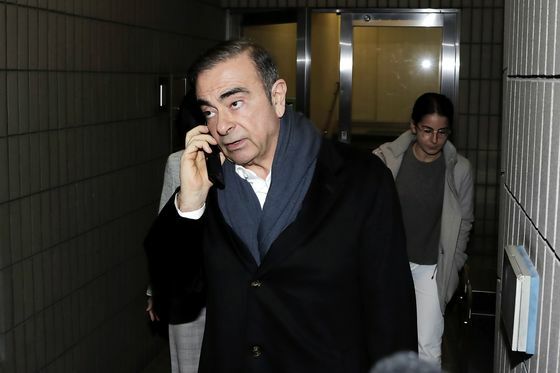 Ghosn’s lawyer is planning to release on Tuesday a video that was pre-recorded in the event of his rearrest. After being freed on bail for almost a month, Ghosn was detained again last week on fresh allegations that he used millions of dollars from Nissan for his own purposes. He’s slated to be held at least until April 14. Nissan severed its two decade-long connection to Ghosn, its former savior, on Monday as shareholders removed the former chairman and chief executive officer from the board. Investors approved the change at an extraordinary shareholders’ meeting in Tokyo that Nissan agreed to hold at the request of its alliance partner and largest shareholder, Renault SA. Last Thursday, Ghosn gave an interview with French television station LCI that may provide clues to what the former executive will have to say. In the prime-time, 20-minute segment, he said the allegations against him stem from a conspiracy led by a small group of people within Nissan who wanted him removed as chairman of the car company and head of Renault and Nissan’s alliance. “There is a systematic demolition going on, and we know who is behind it,” said Ghosn, adding that starting about a year ago, “requests were made to external organizations” to gather information to oust him.